John Muir Trail Thru-Hike: What Surprised Me? Browse: Home » John Muir Trail Thru-Hike: What Surprised Me? Every day of a JMT thru-hike brings surprises, mostly in regards to fauna. 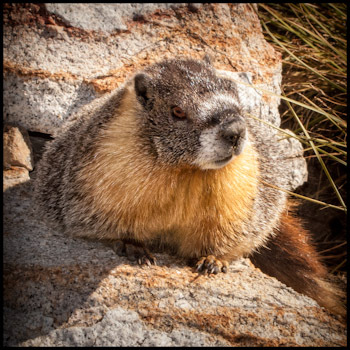 You’ll turn a corner and discover a gang of deer (often right on the trail), a coyote (prowling for lunch) or a friendly marmot (hoping to trade the perfect pose on a rock for a hunk of human food). Sometimes the animals are quite a bit bigger (see entry, below). The scenery may surprise you, simply because you can’t imagine it getting any better, and then it does. And does again. And again. I remember more subtle surprises as well. Here are some of my more memorable ones. A different sense of what a mile is (or a kilometer, if you prefer). There are places on the trail where I could look back and see a spot several miles behind me—a spot where I was standing just a few hours before. Sure, I knew mathematically and geographically what a mile was, but seeing just how far a person can travel, on foot, always amazed me. Then I started transposing the distances I’d travel in a day or two on the trail to my home geography (in my case the island of Oahu). The distance I would travel in one trail day would equate to walking from my home on the southeast side of the island all the way to downtown Honolulu, with substantially less elevation gain. I would never consider walking that! How little I wanted to eat. What’s your favorite snack? Chocolate? Cookies? Nuts? On a good day I can probably pass on the chocolate and cookies, but there’s no resisting almonds and walnuts. Now, imagine looking at a single walnut half and thinking to yourself that there is no way you can eat the whole thing. Such was my experience on the trail. I have no idea where my appetite went, but it was nowhere to be found. Interestingly enough, when I got to the snack bar in Tuolumne Meadows, the Mule House Café in Red’s Meadow, and the dining room at Muir Trail Ranch, I ate like a horse. Not so on the trail. Judging by the wealth of goodies at the hiker’s barrels at Muir Trail Ranch, I wasn’t the only one who experienced this phenomenon. How quickly the days went, or, to put it another way, how I never got bored. I’ve loved the Sierra Nevada since I was a pre-teen, but it occurred to me that I might get a little bored on day ten, or fifteen, of the hike. Never happened. On days when I walked until dusk I never wearied of the experience (although I was plenty weary). Days when I reached my campsite by 3:30 p.m. and then explored—were even better. I can remember thinking, as I left Muir Trail Ranch, that nine uninterrupted days in the woods would be a very long time. It went by in a flash. You may be tempted to bring an iPod to listen to music or books while you’re walking. You, too, may fear the boredom. My recommendation: leave it at home. Part of the joy of the trail is the change in perspective. “Normal” out there is a little different than “normal” at home. These were some of my surprises; yours may be different. All will be worth experiencing.